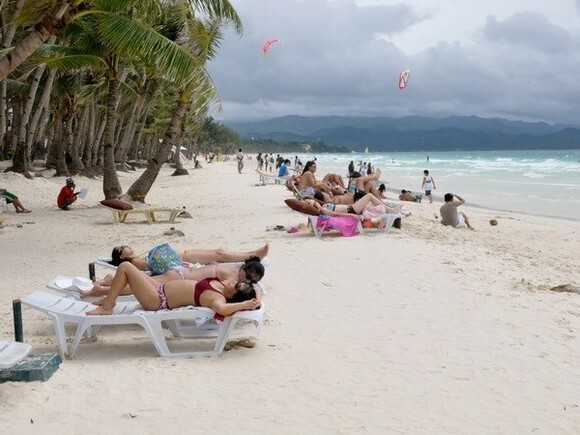 The Philippines closed down its famous holiday island Boracay to tourists on April 26 for a six-month shake-up. Regional police head Cesar Binag said the shutdown began past midnight, with tourists barred from boarding the ferries - the main way to the island. About 600 policemen, including anti-riot officers, were deployed. During the closure, only residents with ID cards are allowed to board the ferries to the island, whose population is around 40,000. On the morning of April 26, police began patrolling the local beach to ensure no oneswimming outside the only one designated area marked by buoys. Boats are barred from sailing within three kilometres of the shoreline and only Boracay residents are allowed to fish in its waters. The government said the security presence was intended to control any risks of public disorder that might arise from the shutdown. President Rodrigo Duterte ordered the shutdown this month after noticing the resort island was plagued by tourism-related businesses dumping raw sewage directly into the ocean.The environment ministry has issued a notice of violation to businesses discharging sewage and ordered the destruction of more than 900 illegal structures in forest and wetlands.